Overview: LTECH is the sixth largest Indian IT services firm, and part of L&T group. LTECH had FY16 revenues and profits of Rs 6,143 crores and Rs 922 cr. LTECH’s revenue, EBITDA and PAT have grown 16.4%, 17.4% and 20.7% CAGR over 5 years. LTECH is a leader among IT services midcaps. It has a good balance sheet, solid global presence and diversified business vertical segments. It has access to rich knowledge pools. We are optimistic that leadership in LTECH will settle down to start shaping a better trajectory in the next few years. Valuations appear attractive. The asking PE at 12.65 times is lower than listed peers. There is a discount of Rs 10/- for retail. There is something on the table for investors. However there are a few risks: the uncertainties at LTECH are on current leadership, low growth rates, and planned acquisitions. Business development appears weak. Outlook: As an investment, the LTECH IPO is rated a medium risk, medium return type of offering. Investors may Buy LTECH with a 2-3 year perspective. IPO opens: Monday 11-13th July 2016 with Issue Price band: Rs. 705-710 per share. A discount of Rs 10/- is offered to retail category investors. Shares offered to public: 1.75 crores of Face Value: Rs. 1 per share, Market Lot: multiples of 20. Shares offered are 10.3% of equity. The IPO is of Rs 1,242 cr. (upper band) which is a sale by current shareholders; there is no fresh issue of shares. The promoter of LTECH is L&T which holds 94.9% stake, and post IPO this will fall to 84.6%. The IPO shares are available to QIB, NIB and retail in ratio of 50:15:35. Post IPO shareholding will be promoter 84.6%, IPO (QIB 5.1%, NIB 1.5%, retail 3.6%) and Others 5.1%. This IPO will unlock value for L&T, as LTECH will be independently valued in line with IT firms. The IPO grey market premium on LTECH is Rs 80 – 83, a positive indication. LTECH is the sixth largest Indian IT services firm, is Mumbai based and part of L&T group. LTECH had revenues and profits of Rs 6,143 crores and Rs 922 cr. resp. in FY16. Its revenue, EBITDA and PAT have grown 16.4%, 17.4% and 20.7% CAGR over 5 years. LTECH has 41 sales & 22 delivery offices globally. See Fig 1. It has 20,072 employees. It addresses clients in diverse industries such as BFSI, insurance, energy, CPG, retail, pharma, etc. See Fig 2. Their range of services includes application development, maintenance, outsourcing, enterprise solutions, infrastructure mgt., testing, digital solutions and platform-based solutions. LTECH has 258 active clients which include 49 from the Fortune 500. LTECH’s top client Citibank accounted for 14.9%, while the top 10 clients constituted 52.7% of FY16 revenue. Citibank, Chevron, Barclays and Time Warner are the largest clients. Revenue geography is in Fig 1. In 2015, NASSCOM ranked LTECH the 6th largest Indian IT services firm in export revenues. They were among top 20 IT service providers globally in 2015 (Everest Group’s PEAK Matrix). A. M. Naik is the non-executive Chairman; Sanjay Jalona is the CEO & MD of LTECH. As part of a business restructuring by L&T, all engineering services businesses of L&T were consolidated under the subsidiary – LTTSL (L&T Technology Services Ltd). The IT services were retained by LTECH. In Jan 2014, LTECH sold and transferred their PES Business to LTTSL. The PES business included the telecom cluster, for services and solutions to telecom clients. As we can see from Fig 3, the operating margins of the telecom business were witnessing a fall. Hence transferring the business to LTTSL was perhaps beneficial for LTECH. L&T is a diversified engineering, construction, manufacturing, technology and financial services company. Income and PAT has grown at 12.4% and 4.3% CAGR resp. over 5 years. In the same duration EPS witnessed a fall of -8.03% CAGR. P/E ratio has however risen to 22.34 times. See Fig 4. L&T has low net profit margin of 5.21%. The current dividend yield for L&T stands at 1.24%. The RoCE stands at 10.6% and RoE at 11.33%. This is average performance. This is the third listing from the group after L&T India and L&T Finance. 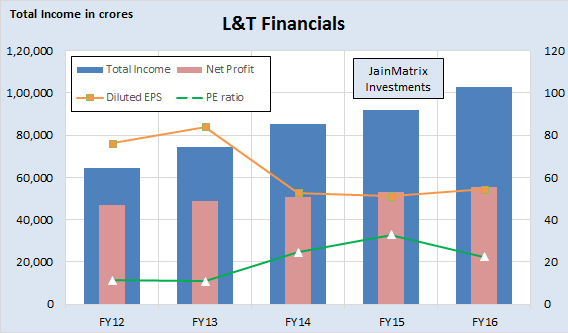 L&T has struggled in the last 3 years. Its hydrocarbon division reported a loss in the 2014 June quarter. Profitability in segments such as power, material handling and metallurgy were flat. In West Asia, there is uncertainty on account of falling crude prices. There was slow revenue recognition in Indian projects due to weak project execution and delay in client payments. L&T’s share price has gained only 4.9% CAGR over 5 years with high volatility. However we are positive that the investment cycle and infra focus will re-emerge over the next 2 years as the economy picks up. Sectors like defense, railways, roads and construction are recovering. L&T is best placed to benefit from this, given its exposure to diverse sectors, its strong balance sheet and positive cash flow as compared to its peers. So we are positive on L&T. It as part of the L&T group benefits from their expertise and experience in a range of verticals. This strong domain experience and understanding of businesses assists in developing and delivering IT services and solutions. This model called “Business-to-IT Connect” by LTECH is a key strength. The management plan is to enhance key new technologies such as their digital platforms, build industry and technology frameworks, the internet of things (IoT), business process digitalization and end-to-end digital transformational delivery capabilities. LTECH plans to increase its geographical reach in markets that have potential which includes Australia, Singapore, Japan, South Africa, India and the Middle East. The INR is holding up against USD, and we expect a range of 66-70 Rs/$, a positive for LTECH. LTECH is targeting a doubling of revenues in the next 3-4 years through acquisitions and organic growth. For acquisitions, the company will focus on the North American and European markets. There was industry speculation that exits of senior executives at LTECH were due to the interference of A. M. Naik. However he has denied this, and said the exits were due to their own decisions. The unofficial/ grey market premium for this IPO is in the range of Rs 80 – 82. In 2015-16, the global economy was characterized by volatility and turmoil. According to NASSCOM, developed and emerging countries experienced multiple headwinds with as economies stagnating, terrorism increase, turbulence in currency and equity markets, and high unemployment. Globally, the total capital investment in technology is estimated at USD 6 trillion in 2014. As per NASSCOM the shift towards digital is inevitable. Incremental expenditures over the next decade may be driven by digital technologies. According to NASSCOM, worldwide IT & business process management spend in 2015 (excluding hardware) was impacted by the volatility in global currencies resulting in a near flat growth of 0.4% (USD 1.2 trillion) in 2015. IT services saw a slight decline in growth (-0.2%). A shift to cloud-based applications led to a decline in traditional IS outsourcing and Network and Desktop Outsourcing. According to NASSCOM, exports in FY16 were USD 108 billion, a 10.3% annual growth. The industry projection is 10-12% for FY17, lower than the 12-14% for FY16. We feel that Indian IT services are gaining market share against US and European firms. This is because of good IT talent & lower cost structures in India, and better service maturity in firms. There are rapid changes in IT services, from linear to non-linear business models, from isolated applications to cloud services & networks. The firms have to take a lead in introducing tech changes. 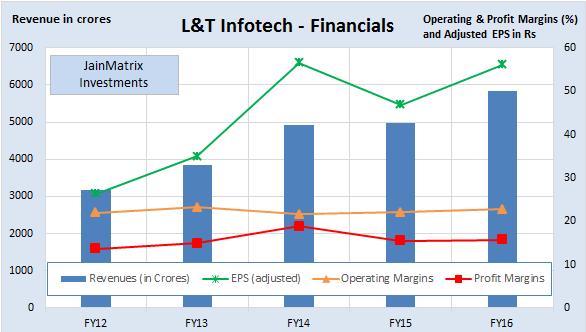 LTECH’s revenue, EBITDA and PAT grew 16.4%, 17.5% and 20.8% CAGR over 5 years. 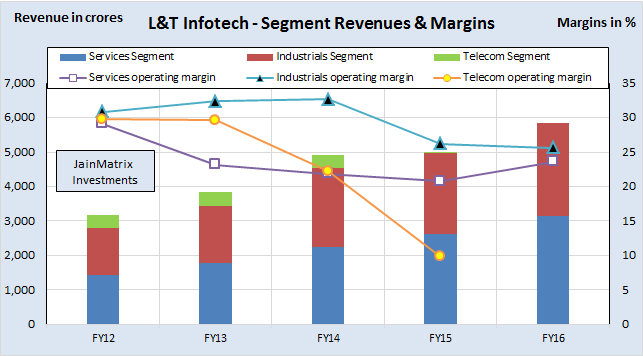 Revenue has grown steadily and margins of LTECH are stable, see Fig 5. However for FY16 LTECH reported a gain of Rs 276.5 cr from forex on a profit of Rs 922.2 cr. Thus 30% of the profits were from Forex gains. The operating margins have been flat over the years. The net profit margin improved marginally to 15% in FY16 from 13.6% in FY12. LTECH witnessed a massive jump 61.8% in PAT for FY14. There was an extraordinary gain of Rs 239.7 cr. for that year since the PES business unit was sold to LTTSL. LTECH paid a dividend of Rs 32.65/share in FY16, a yield of 4.6%. This is a big positive. 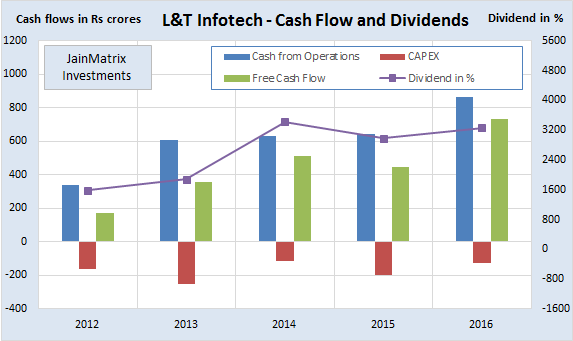 LTECH has positive Free Cash Flow over the last 5 years, a big positive. See Fig 6. LTECH has a ROE of 45.55% (FY16) making it the leader in the industry. The cash per share including Reserves & Surplus and Cash in B/Sheet is Rs 130/share. Hence the operations of LTECH are available in IPO at (710-130) = Rs 580/share. We benchmark LTECH against peers like Mindtree, Infosys, Wipro etc. See Fig 7. LTECH appears to be available at reasonable valuations in terms of PE. It doesn’t look cheap on P/B though. Highest ROE is a positive. But this is because it has a tiny share capital of Rs 16.8 cr. Dividend yield is very good; the balance sheet is strong and can be leveraged in future. Debt is very low, free cash flows are positive. However this is common across the Indian IT sector. Margins are average. Also unimpressive are 3 year growth rates, utilization and profit/ employee. However if we relook at this firm as a mid-cap comparable to only Mindtree and Hexaware, its margins, utilizations and profit/ employee suddenly look good. Only growth looks weak. LTECH has an advantage of association with L&T group, which gives it a great access to 1) specialized knowledge in many sectors 2) a big customer base in India and Middle East. LTECH has a sister firm LTTSL, which is focused on engineering services. There are good synergies between them for cross selling and common sales teams. We believe these two firms are already working together in Sales. With revenues > Rs 5,000 crore and employees > 20,000, LTECH is well placed to pitch for and win large orders of size $10-50 million (70-350 crores). The IPO pricing is attractive. At the upper band of Rs 710/share, LTECH’s asking P/E is 12.65 times which is lower than Mindtree (18.33 times) and other peers. Also there is a retail discount. LTECH is a low debt firm, with strong balance sheet, cash balance and high return on equity. It has a high dividend yield of 4.6%. This makes LTECH attractive. With a good geographic spread and employee strength, LTECH has the potential to grow rapidly. Per management it will double revenues in 3-4 years with acquisitions & organic growth. However we are unconvinced about this, with little evidence of high growth in recent past. We are positive that new leadership will settle in and rally this firm to new heights. The small share capital base (in relation to revenues and profits) is not right and LTECH is likely to award bonuses and rights to shareholders in the next few years to expand this. LTECH has a focus on emerging technologies such as Social, Mobile, AIM, Cloud Computing, Big Data, IoT, Enterprise Integration, Biz Process Digitalisation, User Experience and Cognitive Computing. This is good. LTECH bears a client concentration risk, and top 10 accounts get 52.7% of revenues. However this is not a worry, if the firm gets good growth from new clients. Leadership – There have been many top level exits in LTECH in recent years. This is worrying as any new executive takes time to settle down. Current CEO-MD Sanjay Jalona has been here for less than 1 year. We don’t see a clear strategy from LTECH or how it differentiates itself. The strategy and vision has to come from top management, and so again this issue is related to the executive changes. In FY2014, a restructuring was taken up to transfer the engineering services unit to LTTSL. Typically IT firms like TCS and Infosys include both IT and engineering services. We are unable to find the reasons or justification for this demerger, since we see a good synergy among the firms. Is this a pre IPO clean-up of LTECH? The sister company, LTTSL operates in the engineering services space and has global clients. While these 2 firms have well defined focus, there may be many areas where strong coordination is required. There can be areas of business and sales conflict. About 15 contracts which make up 22% of FY16 business contain benchmarking and most favored customer provisions. They allow customers to benchmark services provided by LTECH to competition, and if found wanting, LTECH may have to reduce pricing, improve the quality of services or provide higher service levels. These can impact revenues and profits. LTECH had reneged on campus job offers – while the firm may not be legally bound to honor such promises, the public perception of the firm can take a beating with such incidents. The attrition rate in LTECH in FY16 was 18.4%, which is slightly higher than industry. It also means that a lot of energy in the firm is wasted in handovers & takeovers and so much knowledge is lost. There is high competition in the IT services market from Indian firms and MNCs. 30% of FY16 profits were gains from forex hedges. This is typically an unpredictable and volatile source of other income, and can easily reverse in the future. All IT exports firms face forex rate fluctuations which have an effect on revenues. The firm does appear to have a good forex hedging policy in place. About 97% of revenue in FY16 came from existing clients. This could be a sign of weak new business and sales pipelines. LTECH has plans to take up acquisitions in future. However the firm does not have much of a history of acquisitions. The task of M&A /integration is complex and risky. The Brexit event recently caused volatility in forex and may affect UK business. This is an example of global business risks. Indian IT services industry clearly has a lot of competitive advantages and as the #6 player, LTECH is in a good position to ride this multi decade rise of Indian tech firms. LTECH is the leader among IT services midcaps. It has a good balance sheet, solid global presence and diversified business vertical segments. It has access to rich knowledge pools. We are optimistic that leadership in LTECH will settle down to start shaping a better trajectory in the next few years. Valuations are at a discount to peers and are attractive. At a PE of 12.65 times, it looks cheaper than other midcaps. There are a few risks listed above that must be understood. Overall, as an investment, the LTECH IPO is rated a medium risk, medium return type of offering. Investors may Buy LTECH with a 2-3 year perspective. This document has been prepared by JainMatrix Investments Bangalore (JM), and is meant for use by the recipient only as information and is not for circulation. This document is not to be reported or copied or made available to others without prior permission of JM. It should not be considered or taken as an offer to sell or a solicitation to buy or sell any security. The information contained in this report has been obtained from sources that are considered to be reliable. However, JM has not independently verified the accuracy or completeness of the same. Punit Jain has a small equity ownership < Rs 2 lakhs in L&T, where he is a shareholder since 2007. Other than this JM has no known financial interests in L&T Infotech Ltd. or any group company. Neither JM nor any of its affiliates, its directors or its employees accepts any responsibility of whatsoever nature for the information, statements and opinion given, made available or expressed herein or for any omission therein. Recipients of this report should be aware that past performance is not necessarily a guide to future performance and value of investments can go down as well. The suitability or otherwise of any investments will depend upon the recipient’s particular circumstances and, in case of doubt, advice should be sought from an Investment Advisor. Punit Jain is a registered Research Analyst (SEBI Registration No. INH200002747) under SEBI (Research Analysts) Regulations, 2014. JM has been publishing equity research reports since Nov 2012. Any questions should be directed to the director of JainMatrix Investments at punit.jain@jainmatrix.com.